Propulsion technologies provide the energy to get to Mars and conduct long-term studies. Modifying a rocket to "pack a major punch"
The second Mars Exploration Rover, Opportunity, was the first NASA mission lifted on what is referred to as a Delta II "heavy" rocket. It is a more powerful vehicle that uses larger strap-on solid rocket motors developed for the Delta III launch vehicle. 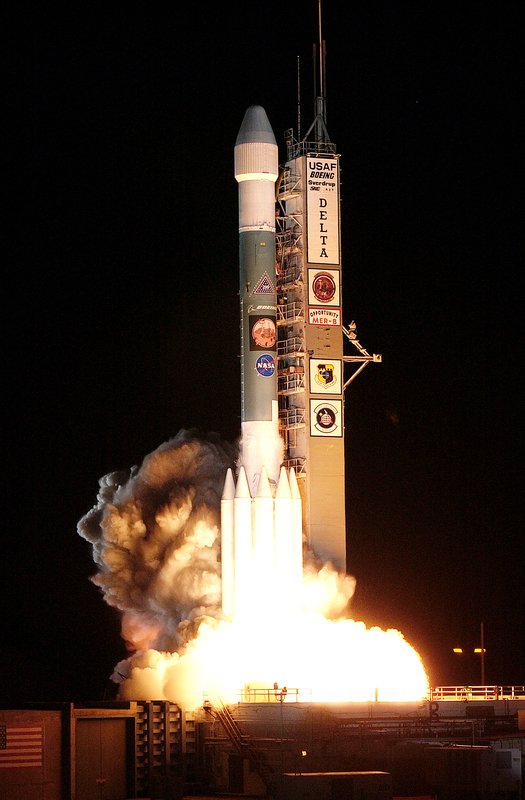 The launch of the MER-B spacecraft was the second use of a core Delta II "Heavy" launch vehicle and the first use of a Delta II "Heavy" launch vehicle with an upper stage. 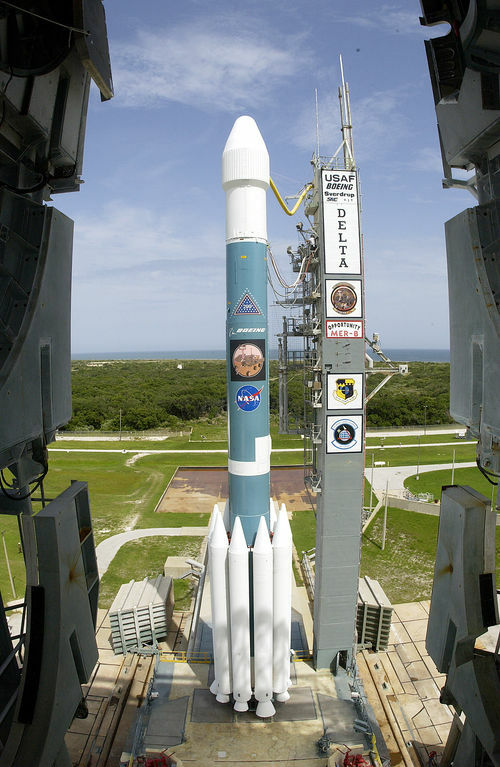 The traditional Delta II rocket (used to lift Spirit) has been used to propel many NASA missions into space and has a history of more than 40 uccessful launches, but some spacecraft need more energy to propel them on their way to Mars and other planets. The Opportunity rover sits inside the fairing of this Boeing Delta II heavy rocket, awaiting its launch and seven-month journey to Mars. The launch period for Spirit used close to the minimum energy to get to Mars in the 2003 opportunity, while Opportunity needed more energy to get to Mars. The two vehicles could not be launched at the same time due to restrictions at the launch site and the availability of supporting teams. Missions sent to Mars often have to conduct "trajectory correction maneuvers" to keep the spacecraft on course throughout its 460 million kilometer (286 million mile) voyage to Mars. With these propellant burns, navigators can change the spacecraft's velocity, move it sideways or turn it. Navigators for Spirit put the spacecraft so close to a bull's-eye with earlier maneuvers that mission managers chose to skip the final two optional trajectory correction maneuvers for adjusting course before arrival at Mars. Likewise for Opportunity, only three trajectory correction maneuvers were required to achieve its "interplanetary hole in one," into a crater that revealed the first bedrock seen up-close on Mars. Technologies associated with these propulsion maneuvers often involve better ways of measuring where the spacecraft is in space so that engineers can determine the appropriate burns needed to tweak the spacecraft's trajectory. 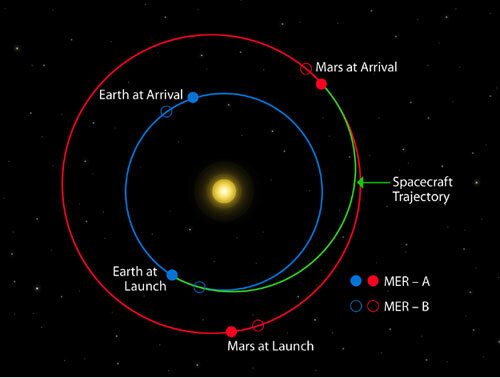 This image shows the position of Earth and Mars at both launch and arrival of each rover. The green line shows the spacecraft's trajectory. Like Pathfinder, the Mars Exploration Rover cruise stage had a star scanner and sun sensor that allowed the spacecraft to know where it was in space by analyzing the position of the sun and other stars in relation to itself. The same precision method that guided NASA's Mars Odyssey spacecraft to within one kilometer (0.6 miles) of its target in martian orbit, was applied to the Mars Exploration Rover mission. Navigators used traditional tracking methods like measuring the time and shift in radio signals sent from Earth to the spacecraft. The two traditional tracking methods, ranging and Doppler, were complemented by a newer method called "delta differential one-way range measurement." It adds information about the location of the spacecraft in directions perpendicular to the line of sight. Pairs of antennas at Deep Space Network sites on two different continents simultaneously received signals from the spacecraft, then used the same antennas to observe natural radio waves from a known celestial reference point, such as a quasar. Successful use of this triangulation method can shave several kilometers or miles off the amount of uncertainty in delivering the rovers to their targeted landing sites. Opportunity landed about 24 kilometers (about 15 miles) down range from the center of the target landing area. Spirit made it to within 10 kilometers (about 6 miles) of its intended landing area.